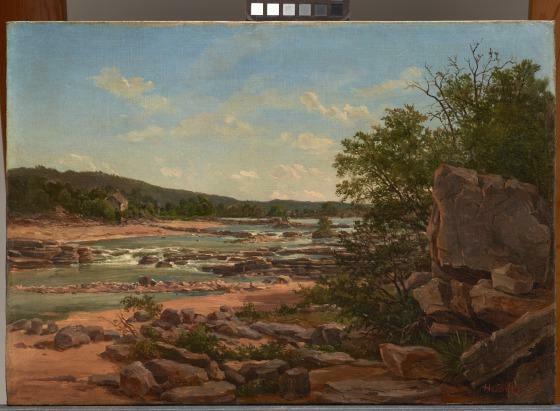 Though ostensibly a landscape depicting the shallow Colorado River flowing northwest of Austin, Texas, this painting now also acts as a historical scene. The Marble Falls William Huddle admired in 1885 were submerged beneath a lake when the Max Starcke Dam was completed in 1951. The area around the Highlands Lakes continues to display swaths of pink granite, which Huddle emphasized in contrast to a brilliant blue sky. Huddle opened a painting studio in Austin in 1876 and apart from a year studying portrait painting in Munich, he remained there the rest of his life. 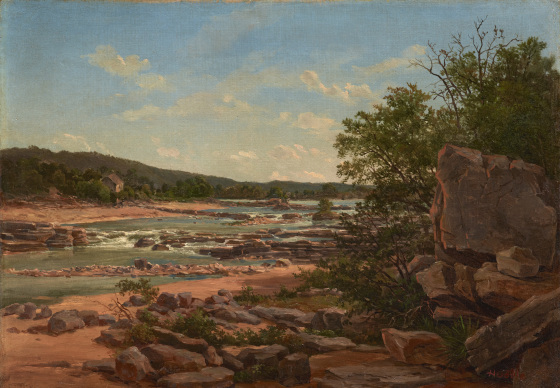 He is best known for producing a series of portraits of Texas governors, generals, and politicians from the state's history. What was once a picturesque representation of Huddle's home territory can now be grouped with his figural works as a monument to earlier times. Learn more about Marble Falls at the Texas State Historical Association website.